All too often those serving in the Canadian Military do not receive the recognition they deserve. Of course, most are quick to thank them for their service. Or to pay homage to them on veteran’s day. What is often forgotten about is the everyday financial hardship. Which many of them face. It is just one additional sacrifice that they make. In their line of duty. It doesn’t matter whether they are on active duty. As they are always on call for when their country needs them. There needs to be more recognition. By both the private sector as well as the business sector. When it comes to the commitment our soldiers and military personnel have made. Being able to lessen their financial burden would be an effective way of doing this. Something simple but highly important. Like giving them better rates on their vehicle Insurance. It is one positive step. There are a few such Insurance providers that have recognized this. For being a way that they can give back to the Canadian Military personnel. However, there are only a few companies that are dedicated to doing this. At least one company has been able to develop a discounted insurance policy. Applicable for the Canadian Military through the offering of group rates. Military personnel that opt for this kind of insurance can also have coverage included for their family members. The discounts being offered can amount to significant savings. It may even be available for those who are members of the Canadian Military. But are not currently on active duty. Several years ago there was more attention paid for the provision of reduced insurance rates. Applicable for the Canadian Military. Unfortunately, some of these programs no longer exists. There are also some Insurance Companies that offer special discounts based on professions. Being part of the Canadian Military may be one of the qualified professions. Again, this will come under the umbrella of group insurance. It means that military personnel wanting to take advantage of this will have to join a group. One that has opted for this type of insurance coverage. There are some great advantages to doing this. Group insurance, in general, is usually less expensive. It is because the Insurance companies are offering a set type of insurance in bulk. There are a lot of people who join the group. So the Insurance Providers can give a better rate based on quantity. The insurance is being delivered under a group policy. Each participant still receives individualized attention. They have easy access to their insurance provider. For example, when they have questions. Or when there is a need to file a claim. Plus, it isn’t just for the military member, but it applies to their family as well. It can be difficult for one to get Canadian Military discounts on their own. Shopping for any vehicle insurance can be time-consuming. But our car insurance quoter can help with this. 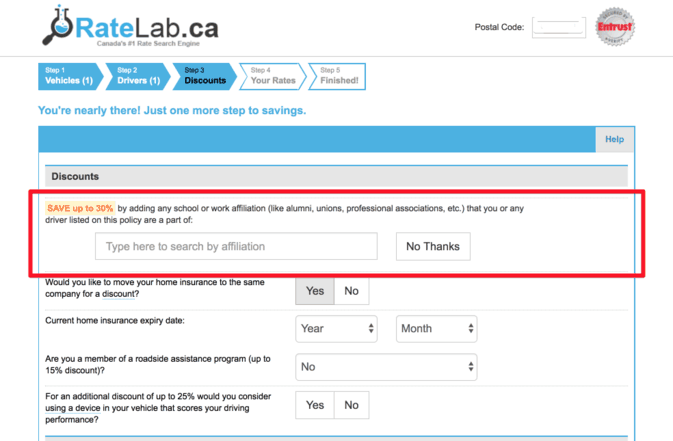 After entering your postal code above, you will be asked to enter vehicle details and your driving history, you will get the screen below to search for your affiliation to save. Enter your postal code above to get started. It may turn out that someone in the Military is not eligible to join a group. Or, there isn’t a group available there are other ways to save on insurance. It can be done by knowing what the Insurance companies are going to expect from you. 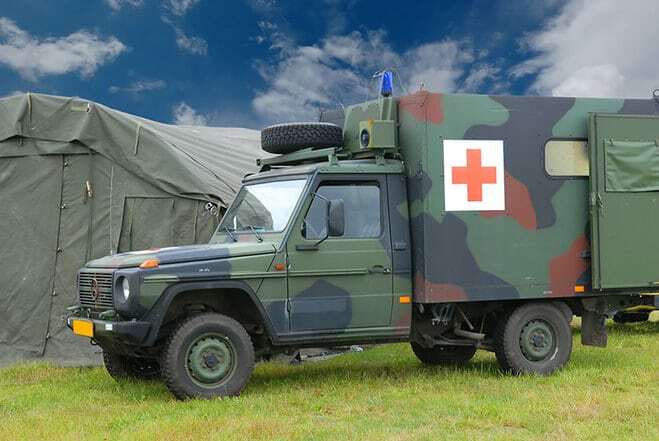 They will have the same expectations even if you opt for group Military Vehicle Insurance. Maintaining a good driving history is going to be very important for getting reduced insurance premiums. Military personnel that are home on leave need to exercise driving caution. It only takes a certain type of driving infraction to mar a clean driving record. Many Canadian Insurance Companies are now offering reduced rates for vehicles that are experiencing low mileage. As a person in the military, it may be that you are not using your vehicle nearly as much as you do as a civilian. You may be able to take advantage of this. By letting the Insurance provider know that you are in the Military. Therefore you are not using the vehicle as much. Even if your spouse is using the vehicle, it may still qualify for the low mileage discount. Not every insurance provider offers this particular discount. It is one of the reasons why using a resource for getting insurance quotes can be so helpful. It is not unusual for those in the Canadian Military to be away from home for long periods of time. It may mean that their vehicle is being left sitting in the garage during this time. There may be no point in paying for insurance for a car that isn’t being driven. It is something that can be brought to the attention of the Insurance Provider. They may recommend suspending the insurance during these times. Many don’t realize that Insurance is a personalized product. They assume that all insurance is the same. It doesn’t matter what one is employed at. Generally speaking, where a person is employed does not affect the insurance premiums. But, with military personnel, this is a unique situation. Mostly because they can be away from home for long periods of time. The amount of time an insured driver is on the road can be a factor in insurance costs. There is true value and a great possibility for potential insurance savings by shopping around. But, for those home on leave from their Military duties they don’t want to waste time doing this. They don’t have to. There are some quick and easy ways to get insurance quotes. These can then be compared. When doing so, the Insurance providers included in the quotes can be informed about the Military involvement. The insurance companies can then determine what kind of savings they can offer those that are serving their country. It is well worth the effort as the potential for discounts can mean great savings in vehicle insurance costs. If you cant find your affiliate or discount program, you may try these companies. This is an insurance provider that can help those in the Canadian Military get affordable rates. They do this by providing insurance packages. They do this through group insurance options. As part of the group, one gets to enjoy discounted rates. Each member is serviced on an individual basis. By doing this military personnel gets to enjoy the proper vehicle insurance coverage at discounted prices. There are some insurance companies that cater to the vehicle needs of the Military. One of these is TD Insurance. They have chosen to target the Canadian Military Engineers. Specifically, those that are members of the Canadian Military Engineers Association. This is explicitly offered through the TD Insurance Meloche Monnex program. This TD Insurance offering is a division of the TD financial sector. They are well known for offering quality products backed with impeccable customer services. CFMWS stands for Canadian Forces Morale and Welfare Services. This is an organization dedicated to helping those in the Military on many different levels. To help them deal with the cost of vehicle insurance, they have connected with Canex. Who has affiliated with the Personal Insurance Company. It is this company that is offering vehicle insurance discounts for the Canadian Military. They are doing this by way of group insurance. Not only is it applicable to the Military personnel but their families too. It even includes student rates. Plus there is coverage for recreational vehicles. The potential insurance discounts waiting for those in the Canadian Military can be substantial. Allstate is committed to assisting veterans in other ways besides insurance. They have started the MET Program. It is the Military Transition Program. It revolves around transitioning military personnel back into the civilian workforce once again. By doing this, it helps to lift the financial burden that many vets are facing. With gainful employment once again it puts them in a position where buying something like vehicle insurance is no longer a hardship. 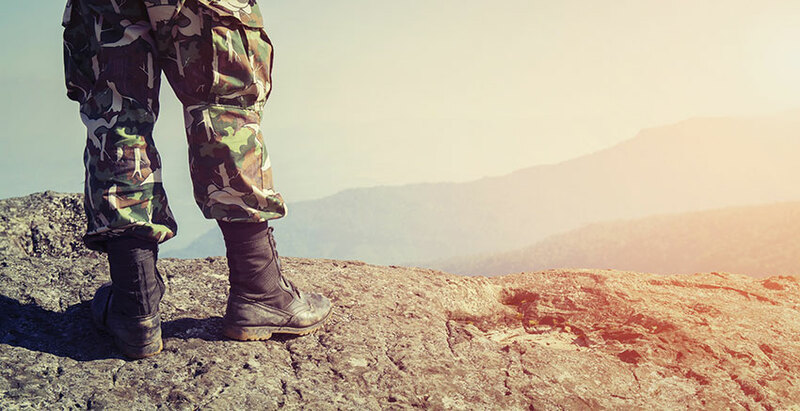 Sisip is dedicated to providing helpful services to Military personnel. They realize that buying insurance is something that is important. To assist them with this they have a variety of different insurance packages that they offer. For those in need of vehicle insurance Sisip has the solution. They have partnered up with The Personal Insurance Provider. It allows those that want affordable insurance to buy it through a group plan. It makes it stress-free for those who need personalized vehicle insurance coverage. Although part of a group every member is still treated as an individual with their own specific insurance needs. Bridge is an Insurance broker who serves those in need of insurance in Alberta. They cater to the insurance needs of the Canadian Armed Forces. Not only do they assist those on active duty but also those that have retired. The company works diligently at getting insurance discounts that are going to be instrumental in reducing insurance premiums. They seek out discounts that will help with a deductible waiver. They will look for ways to increase the basic coverage with no additional costs. Bridge will work hard at finding insurance discounts for recreational vehicles. Those in the Military or the vets will want to see what this company can do for them.